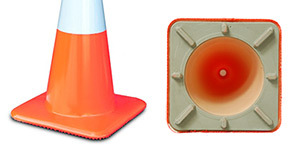 Traffic cones, also called safety cones, road cones, highway cones, or construction cones, are usually cone-shaped markers that are placed on roads or footpaths to temporarily redirect traffic in a safe manner. Traffic cones mark Temporary Traffic Control (TTC) Zones, "An area of a highway where road user conditions are changed." They are often used to create separation or merge lanes during road construction projects, automobile accidents, planned events, although heavier, more permanent markers or signs are used if the diversion is to stay in place for a long period of time. Many of our cones have standard uses, see below: However this guide only offers suggestions and many of the colors can be used as accent colors, to match color schemes, for corporate logos, valets, VIP, special events and more. Orange Cones used to mark Temporary Traffic Control Zones. 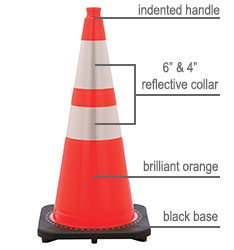 Lime-Green Cones signal increased pedestrian activity and mark entryways. Blue Cones used to mark accessible parking and signal overhead wires. White Cones for valet parking, equestrian sport, and sponsor display. 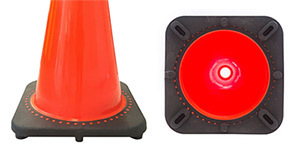 Red Cones guide indoor machine traffic and block workplace hazards. Yellow Cones used to caution the public in indoor areas (wet floors). Pink Cones for children's areas, celebrations, and cancer awareness.